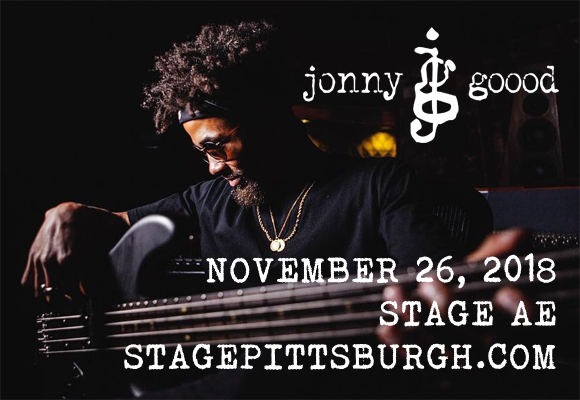 A hot bass talent whose skills have seen him work with the likes of Keyshia Cole, Joe Jonas, Miley Cyrus, Jhene Aiko, Wiz Khalifa and Lady Gaga, Jonny Goood comes to Stage AE on Monday 26th November 2018! Goood brings bass hop to the stage – flavored with funk and all things groovy, but with a raw and powerful edge! Don't miss your chance to catch this incredible performer live! "Goood, whose bass-playing has graced the works of Keyshia Cole, Joe Jonas, Miley Cyrus, Jhene Aiko, and Wiz Khalifa, is a self-taught prodigy, whose mastery of all things musical previously culminated on him playing the position of a musical director for Juicy J and The Weeknd. Now located in LA, the hard-working rapper/hustler has worked nonstop to carefully craft his own buzz outside of being a backup musician–and so far, it seems to be working."